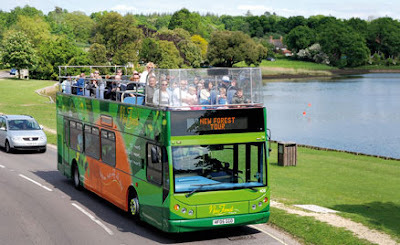 Businesses and communities in the north and west of the New Forest National Park are gearing up for a successful summer thanks to a new route for the New Forest Tour open top bus which starts this weekend. From 23 July to 4 September the New Forest Tour will be bringing visitors to the west and north of the Forest to complement the existing route in the south and east which carries over 18,000 passengers a year. People taking the new circular tour route can visit Ringwood, Fordingbridge, Sandy Balls Holiday Centre, Ashurst, Lyndhurst and Burley. The ticket includes a Brand New Forest card which gives access to discount offers at local businesses on the route including places to eat and drink, shops, and attractions. The commentary along the way includes a history of the village of Burley – famed for its witches, natural history at Liberty’s Raptor and Reptile Centre, smuggling stories from the Ringwood area, and the Forest’s links to World War II. The new hop-on hop-off New Forest Tour route has been made possible by a partnership between the New Forest National Park Authority, Wilts & Dorset bus company and Sandy Balls Holiday Centre. All New Forest Tour buses have room onboard for up to four bikes and the routes have been designed to link to the Forestry Commission’s comprehensive gravel track network. Chris Gregory, the National Park’s Transport and Tourism Officer, said: ‘From the open top deck you will get a view of the Forest like no other. Flexible ticket options have also been introduced to encourage customers to get the most out of the New Forest Tour. These include a new two-day ticket which will be valid on both routes (adult ticket £12). Buy your ticket today and view the timetable and route map at www.thenewforesttour.info.